The Chiloquin Community Forest and Fire Project (CCFFP) is a partnership effort between private landowners, federal and state agencies, and other partners. 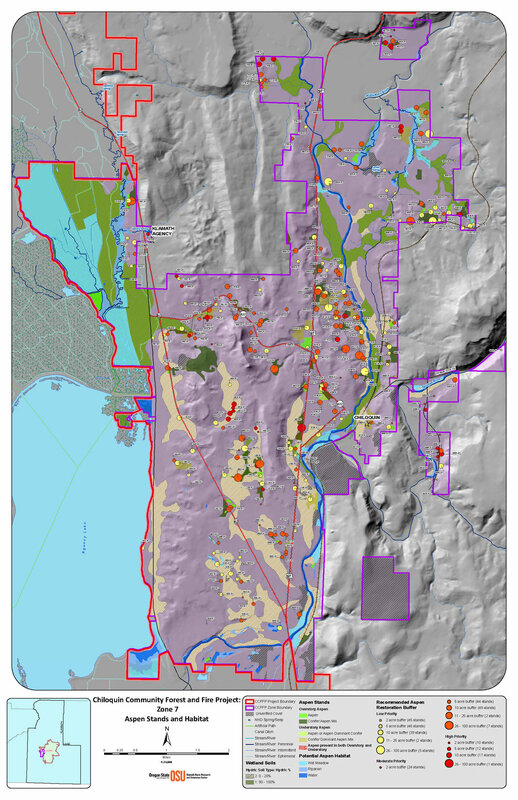 The purpose of the project is to achieve fire resistance, fire response, forest health, wildlife habitat, and grazing objectives on private lands on a landscape-level scale, across boundaries, with Fremont-Winema National Forest. Planning and implementing forest health and defensible space treatments across ownership boundaries will result in a landscape resilient to natural and human-caused disturbance. We have completed forest health and fire risk mapping of private lands across the CCFFP. 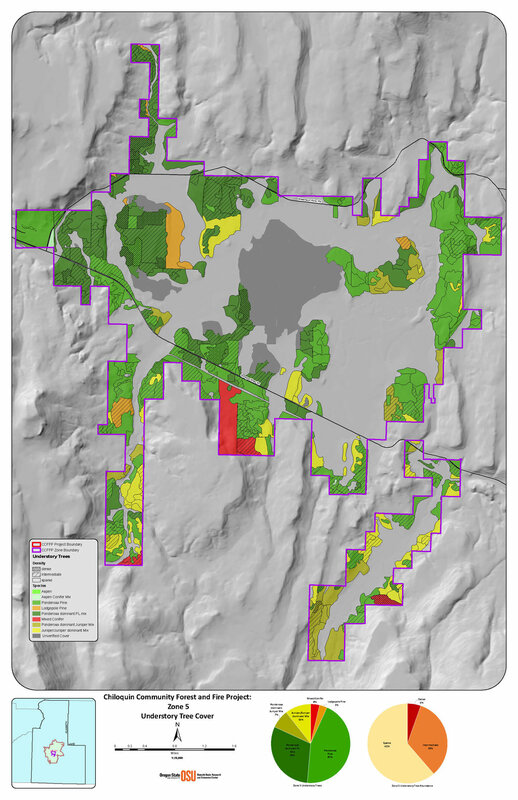 This mapping will provide landowners information on forest health and recommended treatments to reduce risk, which could be used to write a land management plan. The ultimate goal of the partnership is to acquire grant funds to allow landowners to complete forest treatments of their property to reduce the risk of wildfire. In 2019 KLFHP will be reaching out to landowners through mailings, meetings, workshops, phone calls, social media, and visits. Subdivisions with Home Owners Associations or Road Districts will have specific meetings, presentations, mapping, and planning. Partners from KLFHP and engaged landowners will seek to make personal contact with every landowner in the project area to spread the word about this unprecedented opportunity for technical and financial support. The Chiloquin Community project encompasses approximately 38,800 acres of private land, 60% of which is forested. The entire area is high-risk for wildland fire as identified in the Chiloquin Community and Klamath County Wildfire Protection Plans. In spring 2017, a preliminary analysis of all private lands in the project area was completed using high resolution aerial imagery. 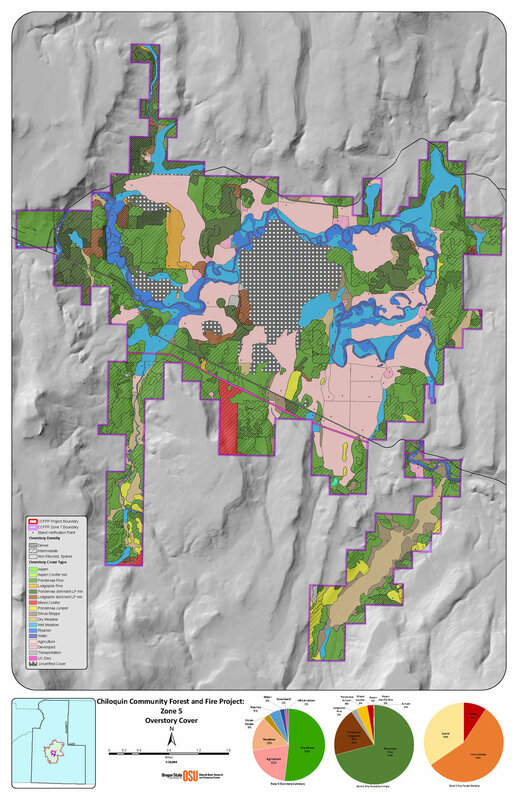 This mapping, done at 1:15,850 scale, delineates stand boundaries and includes an initial classification of overstory cover type, age, and density. In summer and fall 2017, field validation of forest mapping was conducted by public roads and on properties where landowners were engaged and have granted permission. Maps were completed at the 1:3,600 scale, and stands were classified as high, moderate, and low priority for forest health and fire risk. Scroll through some of the summary maps below. 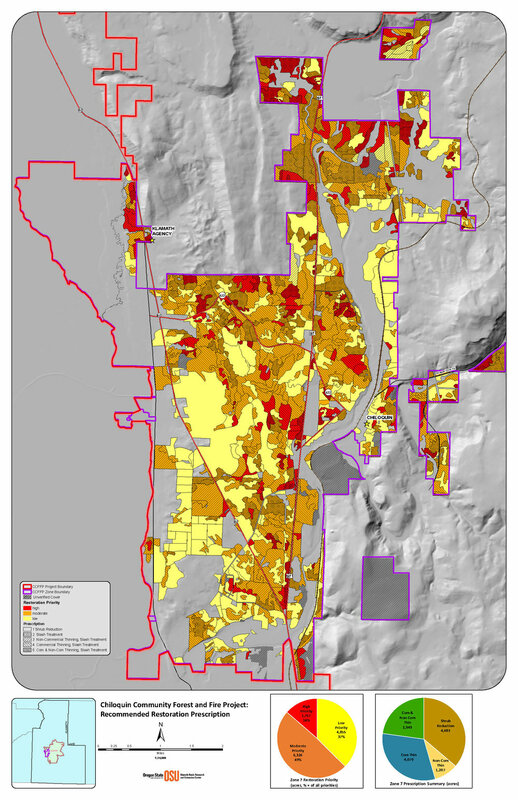 In partnership with Chiloquin Fire and Rescue, priority maps were expanded to include areas of greatest concern for wildfire risk based on population density, ingress/egress, and other community variables (see map below). In winter and spring 2018, forestry crews conducted wildfire risk assessments in conjunction with door-to-door outreach starting in these high priority areas. As landowners, and in some cases subdivisions, become engaged, KLFHP will work with them to identify recommended forest treatments as a foundation for land management plans. 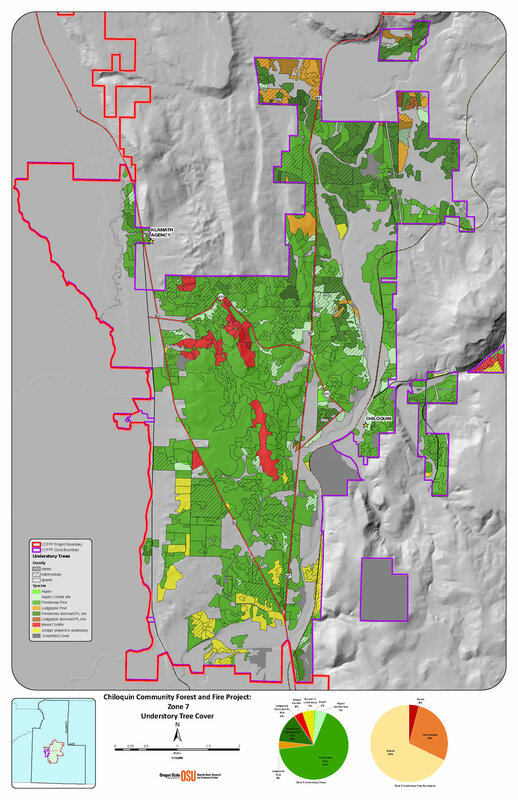 Priority map for forest restoration based on vegetation mapping and wildfire risk to residents and community resources (click to enlarge). As of Spring 2019, the partners are now working with landowners to create treatment plans that meet landowner objectives and project goals. KLFHP is working to identify funding sources to implement projects on private lands for those landowners that are ready to go. In some cases funding may already be available, but partners are actively seeking additional grant funding through state and federal sources that will be necessary to meet landscape-level implementation objectives over the next few years. Landowners within the project area may contact us to see if any of the current funding is available to be used on their property. In late July 2017, Chiloquin Fire & Rescue began on the ground work in the Woodland Park subdivision north of Chiloquin. With funding from a FEMA grant and field support from the Keno Fire District, workers began thinning dense forested areas, mowing brush, and trimming dead and low-hanging branches on several private lots to reduce fire hazard and fire behavior intensity. Keno Fire Chief John Ketchum uses their district Bobcat with a mower attachment to remove dense and decadent brush material and smaller diameter trees. Keno fire crews remove lower branches that may serve as ladder fuels that can take small ground fires and elevate them into the forest canopy.